FAIRFIELD, NJ--(Marketwired - May 1, 2017) - For more than two years, TeleBrands (a U.S. company) and Zuru (a Chinese company) have battled for market share in the "rapid fill" water balloon market. Although TeleBrands sought to compete in the marketplace, Zuru used unconventional tactics and the courts in an attempt to strong arm TeleBrands off the market and prevent retailers from stocking TeleBrands' products. But adversity breeds innovation. Responding to online reviews complaining that Zuru's Bunch-O-Balloons don't hold water long enough, TeleBrands invented a revolutionary "anti-leak" valve for its Easy Einstein Balloons, "The World's Smartest Water Balloons," (www.EinsteinBalloons.com). TeleBrands launched the new balloons in March 2017. On April 26, 2017, the U.S. Patent Office advised TeleBrands that it will soon issue a patent that protects this amazing new invention. "I am pleased that the Patent Office recognized the innovation of Easy Einstein. They fill water balloons super-fast and keep them filled long enough to enjoy the fun," said A.J. Khubani, co-inventor of Easy Einstein Balloons. "At the end of the day, consumers will decide who wins this balloon fight by choosing the better product." 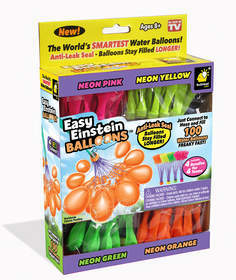 While supplies last, Easy Einstein Balloons are available at Walmart, Bed Bath and Beyond, Walgreens, Ace Hardware, www.BulbHead.com, and other retailers.